Conservative artists felt they were patriots above all other things. As seen in the Picturing Partners and Envisioning Enemies areas of this exhibit, the strict divide between the patriotic and the un-American infused their portrayals of individuals, groups, and organizations in the social, political, economic, and cultural arenas of the United States. In the three sections that comprise this final portion of the exhibit, the conservative eye turns to the state and fate of the United States as a whole. Threatened Icons shows three of the most common abstract icons that conservatives used to represent the United States: its seal, its flag, and the Statue of Liberty. 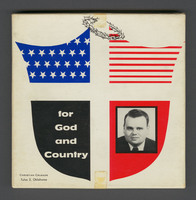 Conservative artists portrayed these three symbols in various states of vulnerability to highlight the imminent threat of destruction, but it is important to note that the images themselves are politically neutral: absent the contextualizing titles, articles, fact sheets, and speech recordings that these images adorned, there would be little to indicate that they were deployed for conservative reasons. Connecting to the Past features variations on the common conservative argument that contemporary Americans have strayed from the true values of their patriotic forbears. In these images and countless others, minutemen, Revolutionary War battles, and individualistic "justice" compete for originalist heartstrings. A number of fringe groups took this logic to its ultimate extreme, arguing that Nazism, for example, was the true path to regaining US values predicated on white supremacy. Finally, Flying the Flag portrays what is probably the most common icon that all artists use to represent the United States: its flag. Unfurled in order to justify causes as varied as evangelical Christianity, anti-communism, and free-market economics, the flag in these cases is a catch-all symbol designed to quickly suggest the patriotism of any given conservative stand. Yet as with the other icons in "Portraying Patriotism," the flag is a non-partisan symbol that is invoked by highly ideological partisans in order to catch the eye and hopefully win the heart of any American viewer who might consider the conservative message attached to it.